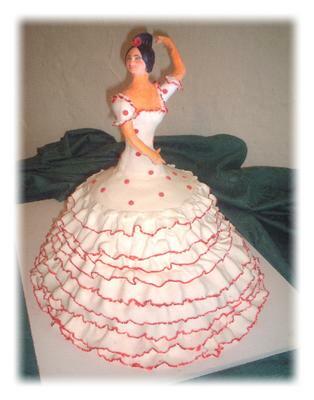 This flamenco free spirit cake is completely made from scratch, no doll was used. The cake is a strawberry sponge cake built up in 4 tiers and sculpted to the shape of the dress. These cakes were filled with a strawberry flavored butter cream icing and sliced fresh strawberries. 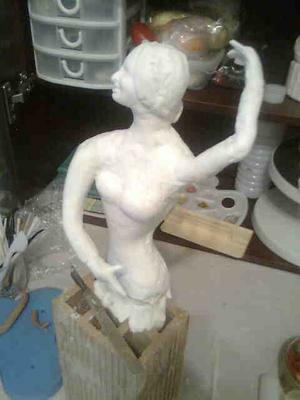 The head and torso are hand modeled in gum paste, built round a dowel which was secured to the board, then hand painted as shown in the second and third pictures above. The cakes were cut in two and fitted around the dowel. The dress is totally rolled white fondant. Each layer is built up from the bottom. Then I painted the red edging. The mantilla and rose were also hand molded from gum paste. She stands 17 inches tall and took approximately 80 hours to complete from start to finish.